The last few months has seen the re-emergence of militant groups in Nigeria’s oil-rich Delta region which has caused major economic and environmental disruption not seen for nearly a decade. That disruption has hurt Nigeria’s economic prospects even as global oil prices have tumbled over the last year. 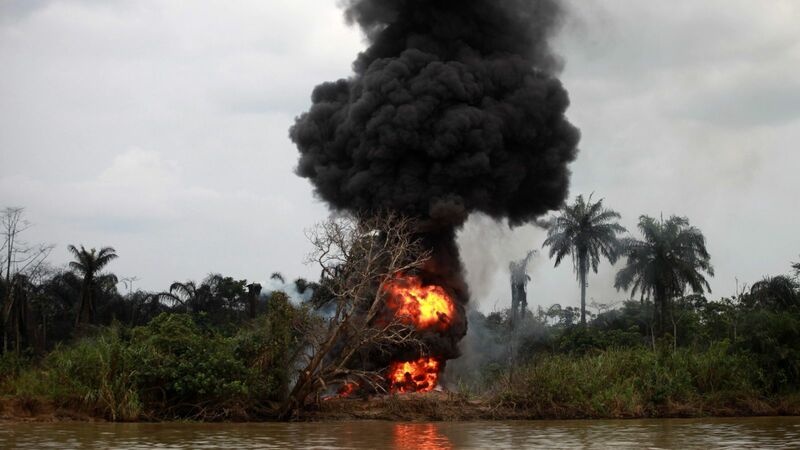 But it is the people of the Niger Delta who will be worst hit. In my work in the region, we have seen the emergence of the Niger Delta Avengers and other militant groups behind this new disruption, they have quickly gained global notoriety with their savvy use of modern techniques like social media while also employing devastating attacks on oil industry infrastructure which has hobbled Nigeria’s oil production. Yet, in my view this is all a consequence of long-running imprudence and the inadvertent promotion of rent-seeking by the Nigerian government in the implementation of a dysfunctional presidential amnesty program. During the implementation of the program, monthly stipends were made to ex-militants and juicy contracts worth millions of dollars were handed to their ‘generals’ to protect the country’s vast network of pipelines and oil facilities. Although attacks on infrastructure reduced during the amnesty period from 2009 to 2015, the government was unknowingly engaging in an expensive venture of buying peace. In my recent meetings with community workers and citizens working for peace and security in the region, local people expressed grave dissatisfaction at how the Nigerian government had entrenched a culture of violence in the region by incentivizing militants with huge sums of money. This ill-advised strategy has rendered it impossible for civil society organizations to implement any rehabilitation program in the region and has effectively opened the floodgates for the increase in militant and cult activities in the region. President Muhammadu Buhari’s victory at the 2015 Presidential elections was also a driver for the rise of hostilities in the region. The President’s body language and utterances concerning his plans for the Niger Delta exhibited not only a misunderstanding of the issues but indifference towards the socio-economic factors that fuel underdevelopment in the region as typified by his inability to visit any of the Niger Delta state so far. Indeed, this was the prevailing view of stakeholders at a recently conducted meeting funded by the European Union that was held at Uyo in the south-south state of Akwa Ibom in June. A lot of the participants at the meeting wondered why the president had not even bothered to visit any state in the region in more than a year since he assumed office. Renewed militancy and violence in the region are basically feeding off these sentiments. Similarly, the cancellation of the planned Maritime University at Okerenkoko in Delta state, the targeting of politicians from the region in his anti-corruption fight and the cuts in the budget of the interventionist agencies are a few of the actions that come to mind. The increased militancy has triggered the deployment of military personnel to the region in vast numbers. Earlier this month, member of Partners of Peace Delta State chapter Prince Ebilade Dakiprebor reported that Nigerian soldiers had invaded Okpelama, an Ijaw community in Gbaramatu Kingdom, with five gun boats in search of suspected militants causing the community people to flee to the creeks for safety. My colleagues in Bayelsa State have also reported incidents of military jets flying low across communities in Ekeremor and Southern Ijaw Local Government Areas of Bayelsa State, resulting in panic from residents and prompting statements from Comrade Udengs Eradiri, the President of the Ijaw Youth Council (IYC) that the military was out to intimidate the Ijaws. It is important to remember that some communities in the region have had a horrifying history with the Nigerian military in the past. A case in point was in Ogoni land in the south-south state of Rivers in 1993, following peaceful demonstrations by the people of Ogoni to mark the start of the U.N year of indigenous peoples, the Nigerian military came down on them with force resulting in a military occupation that lasted for 4 years and led to loss of over 1,000 lives. With revenues from Nigeria’s major export down by 1.114 trillion naira ($35 billion) in the past year as a result of global fall in oil prices, the attacks on the oil facilities represent a harsher reality than just insecurity. As a result of the attacks Nigeria has shutdown nineteen of its thermal plants occasioning acute power shortages in the country. With power supply down by 2500MW and crude production down as well, Nigeria cannot afford another insurgency in the region. Buhari should speak with the militant groups in order to end hostilities, but must not incentivize violence through huge payoffs to ex-militants. Significantly, he also has to convince the people in the region that he means well for them and not give room for ethnic resentments to take roots in the consciousness of the people while he still has the time to do so. The government needs a long-term strategy in the region to address the neglect and underdevelopment in the region. Implementing the Niger Delta Regional Development Master Plan (NDRDMP), a 15-year development roadmap for the region established with robust stakeholder consultation developed in 2006, as a comprehensive policy thrust that is the most concrete articulation of the government’s understanding of the socioeconomic deficiencies of the region is an important step. Since its development, the Federal Government has shown a reluctance to finance the plan. By committing to the NDRMP, Buhari could achieve three things; he would be making a strong case of his genuine concern for the people; he would successfully dismantle ethnic induced sentiments that paint him and those from his region as an enemy of the Niger Delta and he would be sending a strong message that one can address the deeper issues in the region without patronizing the culture of violence and rent seeking that has been perpetrated by successive administrations programme. Failure to deal with this rising violence will have impact far beyond the Niger Delta region alone.